Featuring more than 250 images, Why Mister, Why? is a compelling account from photojournalist Geert van Kesteren. For the most part of 2003 and into 2004, van Kesteren made these images in a struggling Iraq, intertwining them with his personal experience of the situation in diary-like notes. In that way, this body of work resonates with an honesty found only when the narrator and photographer of a story are one and the same. The situation in Iraq, following the declaration of "mission accomplished," represented a culture clash of rare proportions, and van Kesteren was witness to what went wrong. He saw clouds of sadness coming from the mass graves created by the Saddam regime, while Shi'ites enjoyed their awakening freedom. Embedded within the ranks of US troops, he witnessed disgraceful raids on Iraqi citizens. And these accounts are presented here for the reader to see, feel, and try to understand. In a clear photojournalistic way, van Kesteren outlines why it will take a long time before the Iraqi people can enjoy the semblance of peace. Accompanying the images is an introduction by Newsweek senior editor Michael Hirsh, with whom Van Kesteren shared several tense moments in Iraq. Photographs of Iraq, 2003-2004. This extraordinary series of photographs was taken to document scenes of the war in Iraq, 2003-2004, each chapter dealing with an issue: "Iraqis Proclaim Victory as US Leaves Falluja"; "WMD Contradictions: Bremer and Blair at Odds"; "Who Was in Charge at Abu Ghraib"; and "Bush Says Terrorists Will Not Shake America's Will". The text is written in Dutch and Arabic in the copy I have, but explanations are unnecessary, thanks to the quality of the photographs. 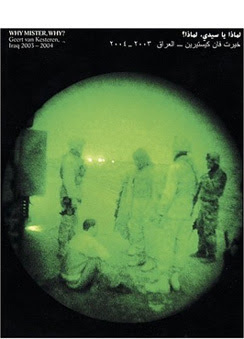 Whether tinted by night-vision goggles into an eerie bright green that gives a sheen of otherworldliness or the shadowy forms huddled in lamplight, the photographer has reached deep inside a country involved in turmoil, attacks and counterattacks, occupiers and insurgents. Most notable and heartbreaking are the faces of the children, always victims in this world gone awry, the desperation exposed to the camera's avid lens, hungry for the human face of war. There are pages of shabby rooms, frightened family members huddled in corners while soldiers search for weapons or explosives, the darkness shading everything more sinister, threatening. Soldiers stand in sharp contrast to the others pictured, weapons at the ready, their faces stoic, determined to complete an unsavory task without incident, children watching wide-eyed as their homes are ransacked, burqa-covered women staring at these young men in army fatigues searching under beds, behind curtains. It is clear that language is a barrier, wives pointing to the handcuffed male relatives, asking questions the soldiers cannot answer. Captive men stand against a wall, hands tied behind their backs, linked to one another, waiting patiently. There is no bias in this collection, at least none that I can see, since only the chapter titles are in English; I will leave it to those who read the small amount of text that accompanies the pictures to make that judgment. I prefer to make my assessment of the humanity in these photographs: careful, circumspect soldiers, men of all ages with identity tags duct-taped around their heads, all silent, hands bound. Family photos strewn over colorful patchwork quilts, the occasional soldier stopping to leaf through the album, perhaps with his own memories of family gatherings. Female soldiers hunker down next to their male counterparts, exercising, riding in Humvees on patrol, staring into empty pits where the earth has been blown out by bombs. Then there are the mass graves, row after row of bodies wrapped in sheets of plastic, tied with rope fragments, tagged with names when possible. Watching the soldiers, a group of children stand nearby, some faces shy, others smiling and curious, all dressed in mismatched, ill-fitted clothes, bright-eyed. Walls of buildings etched with bullet holes. Soldiers seek shade against rickety buildings in the desert heat, feet outstretched in the sand, scribbling letters to loved ones back home. A pile of abandoned, rusted artillery in the middle of a verdant palm grove, an anomaly. The photographer has done an exceptional job, using his talents to capture the harsh realities that seem so far away and are so seldom addressed in the media now that we have grown used to war once more, to soldiers sent across the world in our name. The pictures in this book speak volumes, addressing the nature of war and those who endure it, civilians and soldiers, the living and the lost, but especially the faces of the future, the children. Luan Gaines/2005. Born in Amsterdam, Geert Van Kesteren first worked as a photojournalist in Iraq during Operation "Desert Fox" in 1998. He returned to Iraq in April 2003 and spent several months working on assignment for Newsweek and Stern magazines. His work has been published in many other international magazines, and has led to two books: Mwendanjangula! Aids in Zambia and Why Mister, Why?, about his experiences in Iraq. In 2004, he received the Visa d'or at the Festival Visa in Perpignan. He joined Magnum the following year. Geert Van Kesteren is based in Amsterdam. "Why do you own a gun?"